PHILADELPHIA, PA (KTRK) -- A judge refused to throw out the sexual assault case against Bill Cosby on Wednesday, sweeping aside a former district attorney's claim that he granted the comedian immunity from prosecution a decade ago. Common Pleas Judge Steven O'Neill issued the ruling after a hard-fought two-day hearing, saying witness credibility was a factor. He did not elaborate. In another setback for the defense, the judge also denied a request to disqualify newly elected District Attorney Kevin Steele from the case. Cosby's lawyers had accused Steele of making a "political football" out of Cosby during the campaign. Cosby, 78, was arrested in December and charged with drugging and violating former Temple University athletic department employee Andrea Constand at his suburban Philadelphia home in 2004. The TV star could get up to 10 years in prison if convicted. Cosby held his head in his hands after the ruling, then left the courtroom, using a cane to descend the ornate marble staircase. He waved and smiled at supporters but had no comment. His lawyers put their arms on him to comfort him. The next step is a preliminary hearing March 8 to determine whether prosecutors have enough evidence to put him on trial. The charges represented an about-face by the district attorney's office. In 2005, then-District Attorney Bruce Castor decided the case was too flawed to prosecute. But Castor's successors reopened the investigation last year after Cosby's lurid, decade-old testimony from Constand's civil suit was unsealed at the request of The Associated Press and after dozens of other women came forward with similar accusations that destroyed Cosby's nice-guy image as America's Dad. Cosby's lawyers tried to get the case thrown out with help from Castor, who testified at this week's hearing that he intended to forever close the door on prosecuting the comedian. He said he considered his decision binding on his successors. Similarly, Cosby's lawyers said they never would have let the TV star testify in the civil case if they didn't believe criminal charges were off the table. "In this case, the prosecution should be stopped in its tracks," Cosby lawyer Chris Tayback argued. "Really what we're talking about here is honoring a commitment." Steele challenged Castor's credibility and questioned whether the former DA ever made such an agreement, since it was never put in writing on a legal document and the Cosby attorney with whom Castor dealt is now dead. Steele argued that in any case, Castor had no legal authority to make such a deal. "A secret agreement that allows a wealthy defendant to buy his way out of a criminal case isn't right," Steele told the judge. At one point late in the afternoon, the judge signaled which way he intended to rule. "There's no other witness to the promise," O'Neill said. "The rabbit is in the hat and you want me at this point to assume, 'Hey, the promise was made, judge. Accept that.'" On the stand, Castor defended his decision not to bring charges, citing among other things Constand's yearlong delay in going to police, her continued contact with Cosby, and suggestions that she and her mother might have tried to extort the comic. The former DA said he made the no-prosecution commitment in hopes of prodding Cosby to testify in Constand's lawsuit without invoking his Fifth Amendment right against self-incrimination. In the end, Cosby testified, denying he assaulted Constand but admitting among other things that he obtained quaaludes to give to women he wanted to seduce. Constand eventually settled for an undisclosed amount. While more than 50 women have accused Cosby of drugging and sexually assaulting them since the 1960s, the statute of limitations for prosecuting the comic has run out in nearly every instance. This is the only case in which he has been charged. As the case goes forward, Cosby's lawyers are expected to fight mightily to keep the deposition from being introduced at trial. Castor tried to make a comeback as DA last fall but lost to Steele in a hotly contested race, during which Steele ran ads criticizing Castor for not prosecuting Cosby when he had the chance. The tension between the two men was on display Wednesday when Steele accused Castor and the Cosby camp of engaging in "revisionist history." Most of the back-and-forth in court hinged on the wording and interpretation of a 2005 press release in which Castor announced he would not prosecute Cosby. Castor found himself sparring with prosecutors over many seemingly inconsistent statements he made over the years on whether Cosby could still be charged. The judge said he struggled to find similar cases where a suspect who was never charged received a promise that he would never be prosecuted. Normally, immunity is granted after a suspect is charged because he or she can provide testimony or information to prosecutors. 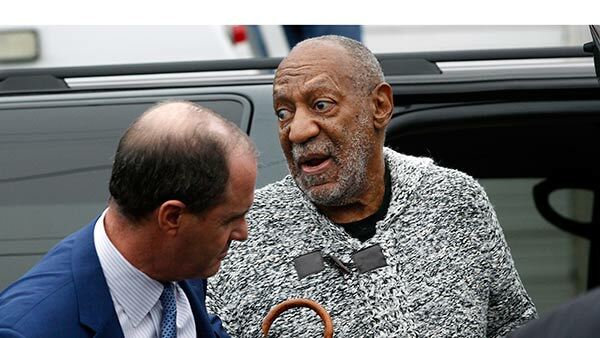 Judge: Bill Cosby is a "sexually violent predator"